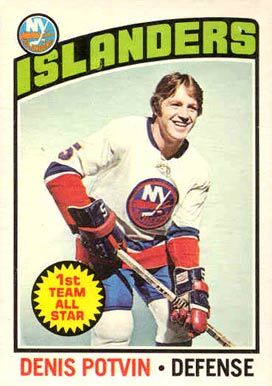 Denis Potvin was the anchor of the New York Islanders franchise and dynasty. His unbelievable strength, his fearless hitting and offensive awareness won him the Calder trophy, three Norris trophies, seven all star nods, and four consecutive Stanley Cups. One of the last great hip-checkers, he was a hard-hitting defensive stalwart. His intelligence and patience quarterbacked the power play and the offense. He was a natural leader, captaining the Isles during their great dynasty. "There were a couple of key elements to my game. I worked on passing the puck. That was as important to me as developing my shot and probably became my most valuable asset. I had a good wrist shot, and I was taught that shooting and passing were the same. But the most fun I had was hitting. I enjoyed the contact, and hockey provided me with a lot of opportunities," he said. He came across as extremely self confident, some would say arrogant which hurts him in talks of all time greats. In the 1976 Canada Cup he was outspoken about Bobby Orr getting all the attention when he felt he was playing just as well. And when he prematurely retired in 1988 he said he had "nothing left to prove" after 15 seasons. "The confidence that I displayed was a security blanket. There were a lot of nights when I was scared to death that I wouldn't be able to do what I was supposed to." Critics also questioned Potvin's dedication to the game. "I hated practicing, and I didn't like waiting between games. I was most happy when the puck was dropped and the game started. I only felt comfortable and confident that I'd make the right decisions when I was on the ice." When he was a junior hockey star, he was already being labeled as the game's next Bobby Orr. The comparisons were justifiable, as Potvin bettered many of Orr's OHL records. "I didn't like being compared with Orr," he admitted, "because we were different personalities with different playing styles, skating for different teams. The only thing we had in common was that we both played defense. What these statements about me and Orr do is make my job that much harder, but I accept that as part of the business." Potvin justified the comparisons though. He broke all of Bobby Orr's goal and point records, although has since been passed by the likes of Paul Coffey and Ray Bourque. He finished with 310 goals, 742 assists and 1052 points. He was the first defenseman to record 1,000 career points. Potvin retired early in the minds of many. He still had a number of good years ahead of him, but he wanted to go out on top. "Before I retired, I wondered, 'What can motivate me? Is there another record, another Stanley Cup?' It looked as if the 1988 New York Islanders were not going to get a lot better quickly and compete with the Oilers for the Cup, and I was 35 years old. I thought of playing somewhere else, but that didn't feel right. I looked for something new and different instead." That something different proved to be broadcasting. He now works on the Florida Panthers broadcast team. Did you know that Denis Potvin scored the fastest three goals by a defenseman in a game . He did it on october 14 , 1978 against the Toronto Maple Leafs , in only 3 minutes and 21 seconds . this is an N.H.L record . My family lived in the same Long Island neighborhood as Denis and he was just as nice off the ice as he was tough on it! He always had time to talk when you'd see him out and about, then you'd go watch him play that night and you got the best on-ice defender I ever saw live! I miss those great days in Islander history! After Bobby Orr, Potvin was the next best defenseman of all time. Orr was in a class by himself. Potvin had it all. A wicked wrist shot where he could score from the blue line. Outstanding defensively, a tough, mean hitter, great hip checks, and maybe the best passing defenseman ever. Because he was such a great all around player, his passing often went unnoticed. Early in his career, until other teams caught on, consistently, he would stand behind his net, take a quick step to the side, and laser a pass right on the stick of a teammate at center ice, sending the teammate on a breakaway. Never saw any player before or after him that could do that. His hits were almost as devastating as Scott Stevens, who in my book was the hardest hitting defenseman ever. And he could also rush the puck, and deke players out, although he did not do that very often in Al Arbour’s defense first system. And let’s not forget that Potvin captained 4 Stanley Cup champions. Not only did Potvin have no weaknesses, but when you think about what you want in a defenseman, he excelled in every aspect. That’s what makes him better than any other defenseman after Orr. 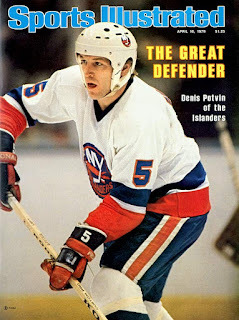 I just wish Denis Potvin would've considered being a coach. He's an excellent communicator, which combined with his intensity, translated into the great leader he was for the Islanders. He could easily function behind the bench as someone who could push all the right buttons and get his players going.